Subject to availability: Tickets will also be sold at the door on the night of the concert. Proceeds will be used to purchase medical equipment and supplies for the Malowa Medical Dispensary in Tanzania. Tipperary. We all enjoyed listening to Michael and Pat perform traditional tunes and stirring songs in an intimate setting. Michael "Piper" Cooney is regarded as one of Ireland's foremost exponents on the uilleann pipes and whistle. 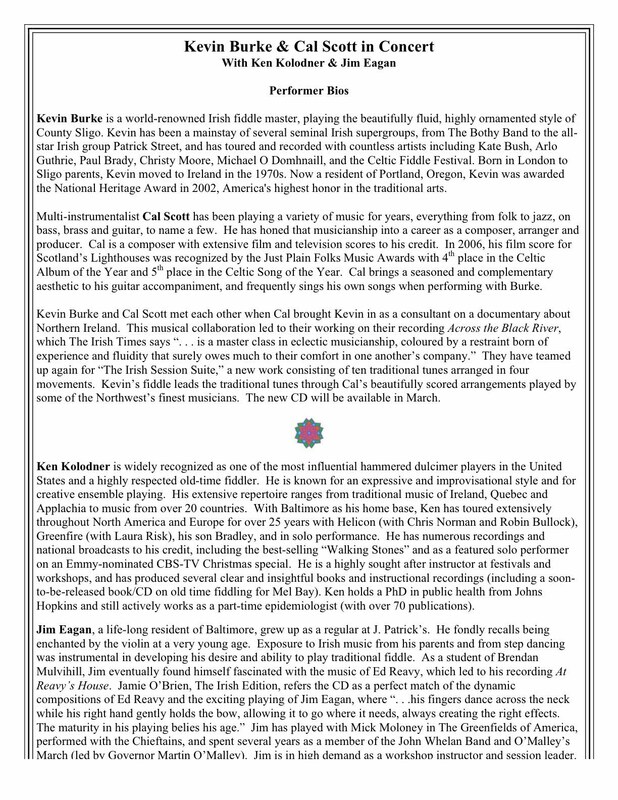 From a well-known traditional music family in County Tipperary, he grew up in the heart of a revival of traditional music in Ireland. His own vibrant style has been influenced by listening to pipers and fiddlers from many generations. Michael's virtuosity and the timeless universal appeal of the pipes has put him in popular demand. He has toured extensively in Europe and America performing with many well-known musicians. He has enthralled audiences throughout his travels. His first CD, "A Stones Throw" released 2003, has met with much acclaim and he has recently released his second CD, "Just Piping" 2010 with great reviews. Originally from County Tipperary, Pat now resides in Baltimore, Maryland. While growing up in his native County Tipperary, Patrick loved the music so much that he used to take his guitar on the back of a horse and cart to school every week to get lessons from his school teacher, Phil Kelly. He would also trudge across fields and farmland with his guitar just to get a song from local singer John Norton. Luckily, there were lots of singers and guitarists in his home parish and one of the first musicians he ever heard playing traditional Irish music was his neighbor – uilleann piper Michael Cooney with whom, along with Paddy O’Brien, he would later go on to form the band Chulrua. Jesse Smith Taught Tunes From "The Ewe With The Crooked Horn." Fiddler Jesse Smith taught a day of Irish Traditional Music Workshops to musicians of all skill levels on all instruments. The workshop* focused on the new CD, described by Jesse as "old music from manuscript and legendary players as interpreted by Smith, Gannon and Blake." In the workshops Jesse also talked about some of his favourite old players and some great books. We were very fortunate to have this opportunity to learn from a great player and teacher in an intimate setting. (Tracks: 1, 10, and 12). Purchase the CD here or on iTunes. 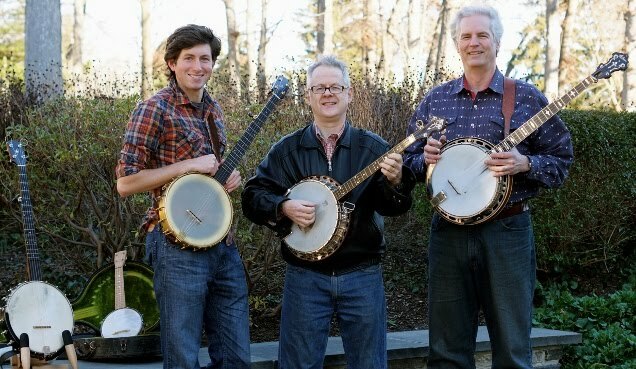 Thanks to all who attended the Baltimore concert and CD release on Wednesday, October 27th, 2010. *Please note that the workshop was not an official BFMS event. 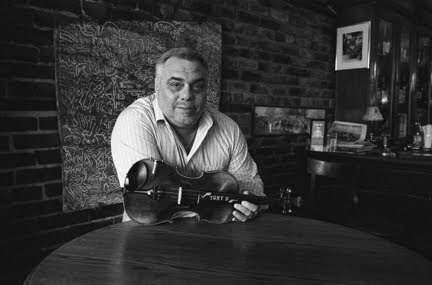 Fiddler Tony DeMarco taught a one-day Irish Traditional Music Workshop to musicians of all skill levels on all instruments. The workshop featured session tunes that are associated with New York and its many great musicians, past and present. We were very fortunate to have this opportunity to learn from one of New York's finest musicians! Here's a list of what we learned! Tony first taught the basic melody of each tune. 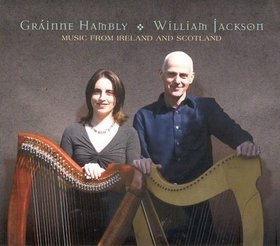 He demonstrated the phrasing and ornamentation that makes Irish music so compelling. This was especially beneficial for fiddlers, but it also proved valuable to players on other instruments. It was great to hear how Tony develops his personal style while remaining true to the tune's heritage. 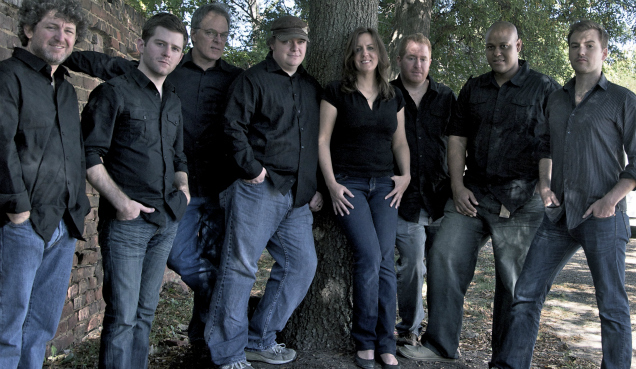 Check out Tony's CD The Sligo Indians on his website! 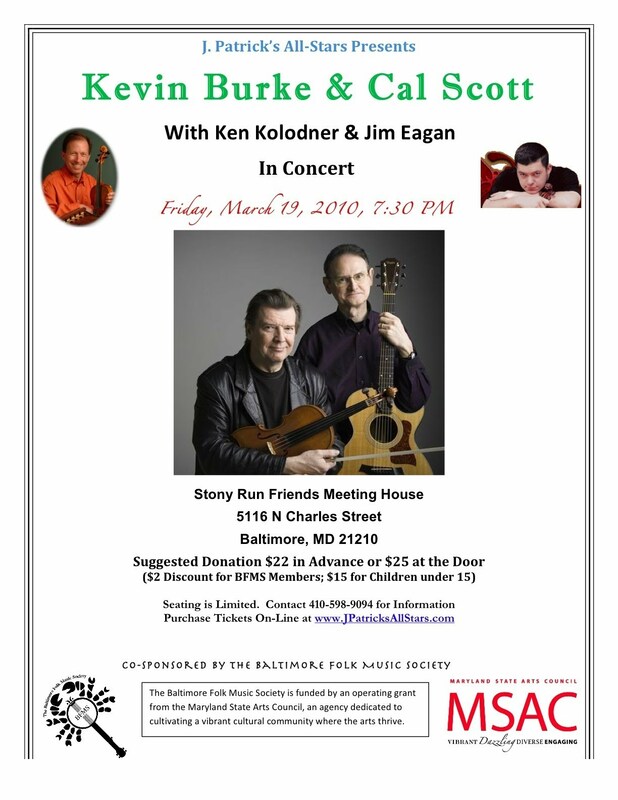 Kevin Burke (fiddle) and Cal Scott (guitar and vocal) presented a rousing evening of traditional Irish Music at Stony Run Friends Meeting House. The opening act featured local favorites Ken Kolodner and Jim Eagan. song) presented a delightful evening of traditional Irish music on Friday, December 4th, 2009, at Stony Run Friends Meeting House. 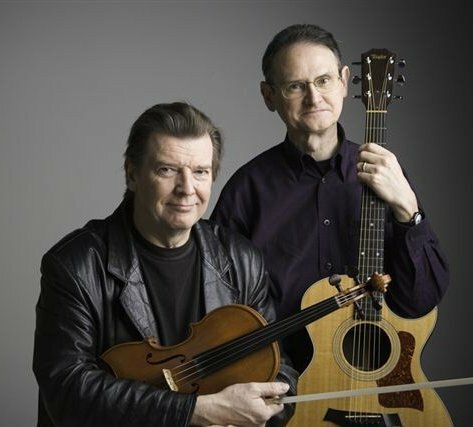 Peter FitzGerald (banjo) and Andrew Thurston (guitar) played a lovely short set to open the concert. 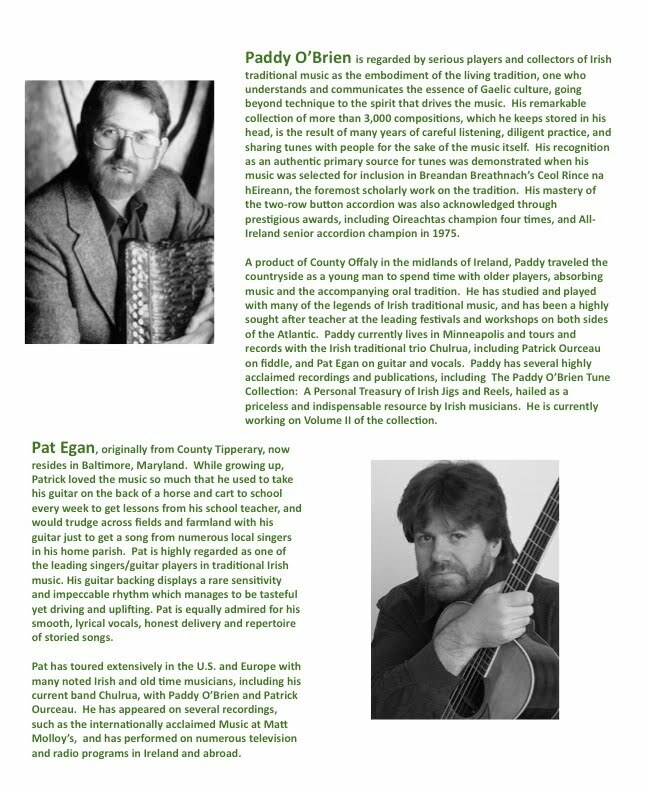 Paddy O’Brien is regarded as the embodiment of the living Irish music tradition, one who understands and communicates the essence of Gaelic culture, going beyond technique to the spirit that drives the music. Pat Egan brings together a rare combination of sensitive guitar backing and impeccable rhythm with smooth, lyrical vocals to highlight a repertoire of storied songs.